To add your own Cufon fonts so that you can select it in the options panel for use, there are a few things you need to do. Go to the Cufon website and upload your font. Fill out the rest of the form and submit it and download the file. Add the following code to the theme functions.php file and we’ll then customize it for your specific font. The example below is for the PR Celtic Narrow font. 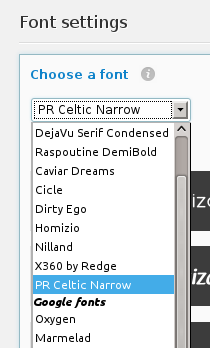 Change celtic_narrow on line 5 to a unique name for your font, all lowercase and spaces changed to underscore, it can be anything.